This species is accepted, and its native range is Alaska to W. & Central U.S.A.
Perennial; caespitose. Culms 50-100 cm long. Leaf-sheaths glabrous on surface. Leaf-sheath auricles absent. Ligule an eciliate membrane; 1-2 mm long. Leaf-blades filiform; involute; 1-3 mm wide; light green, or mid-green. Leaf-blade surface puberulous; hairy adaxially. Inflorescence composed of racemes. 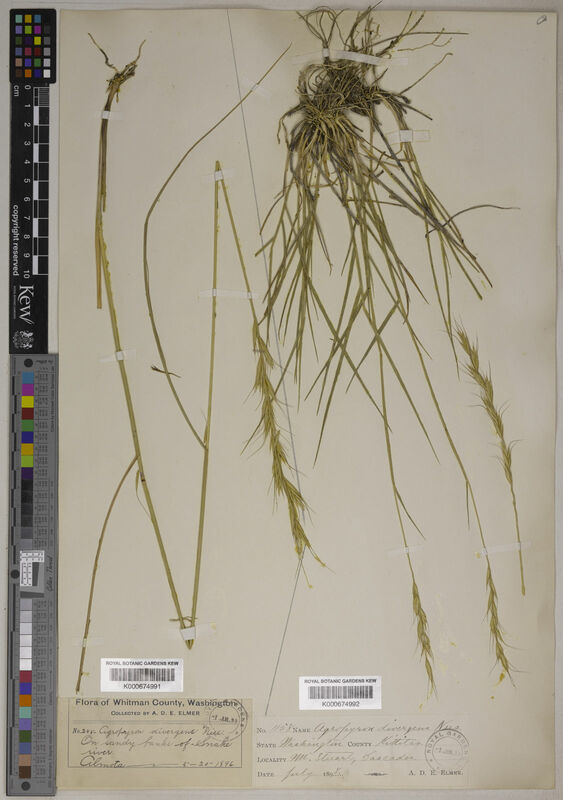 Racemes 1; single; bilateral; 10-25 cm long; bearing 5-12 fertile spikelets on each. Rhachis flattened; scabrous on margins. Spikelet packing broadside to rhachis; lax. Rhachis internodes linear; 10-20 mm long. Spikelets solitary. Fertile spikelets sessile. Spikelets comprising 6-8 fertile florets; with diminished florets at the apex. Spikelets elliptic to oblong; laterally compressed; 20-25 mm long; breaking up at maturity; disarticulating below each fertile floret. Rhachilla internodes 1.5-2 mm long; scaberulous. Glumes collateral; persistent; similar; shorter than spikelet. Lower glume lanceolate; 10 mm long; 1 length of upper glume; coriaceous; yellow; without keels; 3-5 -veined. Lower glume surface smooth, or scabrous; rough on veins. Lower glume apex obtuse, or acute. Upper glume lanceolate; 10 mm long; 1 length of adjacent fertile lemma; coriaceous; yellow; without keels; 3-5 -veined. Upper glume surface smooth, or scabrous; rough on veins. Upper glume apex obtuse, or acute. Fertile lemma lanceolate to oblong; 8-10 mm long; coriaceous; 5-7 -veined. Lemma lateral veins obscure. Lemma apex acute; awned; 1 -awned. Principal lemma awn curved; 10-20 mm long overall. Palea 1 length of lemma. Palea keels scabrous. Apical sterile florets resembling fertile though underdeveloped. Lodicules 2; membranous. Anthers 3. Stigmas 2. Ovary pubescent on apex. North America: Subarctic, western Canada, northwest USA, north-central USA, northeast USA, southwest USA, and south-central USA. Agropyron divergens var. inerme Scribn. & J.G.Sm. 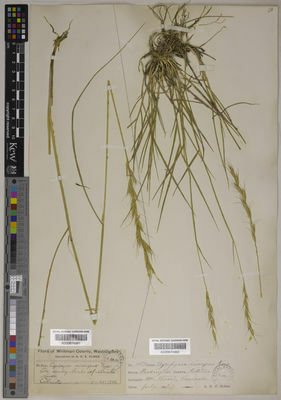 Agropyron divergens var. tenuispicum Scribn. & J.G.Sm. Agropyron inerme (Scribn. & J.G.Sm.) Rydb. Agropyron spicatum (Pursh) Scribn. & J.G.Sm. Agropyron spicatum var. tenuispicum (Scribn. & J.G.Sm.) Rydb. Agropyron vaseyi Scribn. & J.G.Sm. Schedonorus spicatus (Pursh) Roem. & Schult.